In this paper, we introduce a large system of interacting financial agents in which each agent is faced with the decision of how to allocate his capital between a risky stock or a risk-less bond. The investment decision of investors, derived through an optimization, drives the stock price. The model has been inspired by the econophysical Levy-Levy-Solomon model (Economics Letters, 45). The goal of this work is to gain insights into the stock price and wealth distribution. We especially want to discover the causes for the appearance of power-laws in financial data. We follow a kinetic approach similar to (D. Maldarella, L. Pareschi, Physica A, 391) and derive the mean field limit of our microscopic agent dynamics. The novelty in our approach is that the financial agents apply model predictive control (MPC) to approximate and solve the optimization of their utility function. Interestingly, the MPC approach gives a mathematical connection between the two opponent economic concepts of modeling financial agents to be rational or boundedly rational. We derive a moment model which is able to replicate the most prominent features of the financial markets: oscillatory price behavior, booms and crashes. Due to our kinetic approach, we can study the wealth and price distribution on a mesoscopic level. 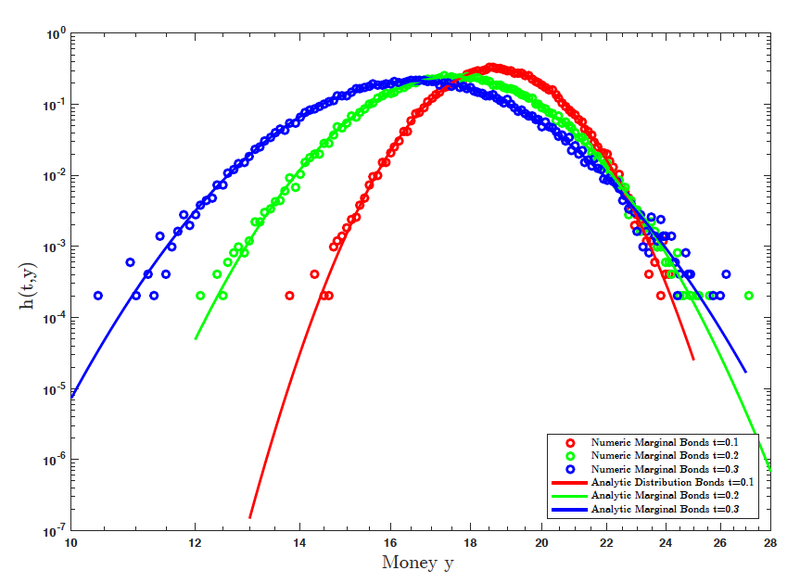 The wealth distribution is characterized by a lognormal law. For the stock price distribution, we can either observe a lognormal behavior in the case of long-term investors or a power-law in the case of high-frequency trader. Furthermore, the stock return data exhibits a fat-tail, which is a well known characteristic of real financial data.